With the rush of the holidays...sometimes taking a shortcut is called for, like making a giant holiday tree using refrigerated cookie dough. Preheat oven to 325°F (160°C). Grease large baking sheet. 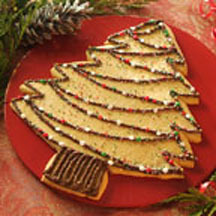 Shape dough into 8-inch-tree shape on prepared baking sheet. Bake for 16 to 18 minutes or until light golden brown. Cool on baking sheet for 2 minutes; carefully loosen cookie with spatula. Cool on baking sheet completely.